A British passenger posed for a photo with his alleged captor on a hijacked Egyptian plane on Tuesday and said it has to be “the best selfie ever”, according to a newspaper report. Four Britons were on the plane when it was forced to divert to Cyprus due to a man wearing a fake suicide belt. 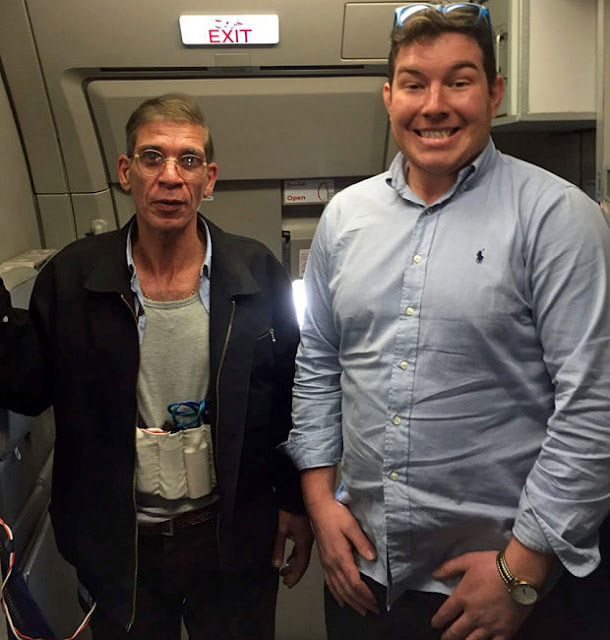 The photograph, widely shared on Twitter, shows a man — named in reports as Ben Innes — with a broad smile, standing next to a man who has what looks like an explosives belt around his waist. The plane was carrying at least 55 passengers, including 26 foreigners, on an EgyptAir domestic flight from Alexandria to Cairo. Most of those on board were freed shortly after the plane landed at Larnaca airport on the Mediterranean island on Tuesday, but the hijacker held seven people hostage for a number of hours before the incident came to a peaceful end. Speaking to The Sun newspaper about the photograph, Mr Innes said: “I’m not sure why I did it, I just threw caution to the wind while trying to stay cheerful in the face of adversity. “I figured if his bomb was real I’d nothing lose anyway, so took a chance to get a closer look at it.